Centre for Pakistan and Gulf Studies » ‘Turkish & Greek Cypriots: Is their separation Permanent? ‘Turkish & Greek Cypriots: Is their separation Permanent? 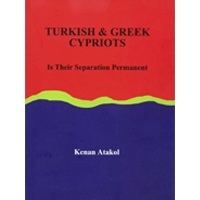 Kenan Aatakol is a Turkish Cypriot and the author of the book “Turkish & Greek Cypriots: Is Their Separation Permanent”. The first edition of the book was published in March 2003; it is now fully edited and has been updated for the final time. The first edition presented a long, complicated but nevertheless interesting history of the island of Cyprus. It describes the time when Greek Cypriots started instigating violent conflicts with the aim of destroying the Turkish Cypriots presence in Cyprus and uniting the island with Greece. This phenomenon was born from the stubbornness and obsession of the people, and resulted in the separation of these two peoples of Cyprus. Aatakol discloses in his book that the people of this region are ethnically, culturally and religiously opposed, but have lived together peacefully over the period of 300 years on this island. He narrates his personal experiences as an eyewitness to many of the events and tragedies that took place during this period, from behind the closed doors of the government office to the destruction of republic partnerships. Furthermore, the book puts forward the reasons for the separation of the inhabitants of this beautiful island and an insight into the Cyprus conflict that has been unresolved for the past 39 years. The updated version of the book gives a clear picture of the political situation and the state of negotiations between the two populaces, with all material data up until 2011. This reveals that nothing significant has been achieved during the tenure of eight years and that political aggressiveness will not open the doors to any positive development. The two sides are still too far apart from each other. Unfortunately, one of the key reasons for the separation of the two peoples is “the enosis obsession” that started in the early nineteenth century and is still continuing, albeit under different pretenses. This essentially meant a movement of various Greek communities that live outside Greece to unite the region with the Cyprus. In other words, completion of the union of Greece with Cyprus that began in mid 1950’s. The beginning of British rule during this same time period on the island destroyed the tranquility of Turkish and Greek coexistence, a condition that was further strengthened by the imposition of various punishments against the people involved in the uprising in Greece and Turkey. Greek Cypriots were not fighting the British for independence but for this enosis campaign. The separation of the Turkish and Greek Cypriots first occurred when more than 234 mixed villages disappeared from the island about 125 years ago. In December 1963, Turkish Cypriots were pushed out of the Government and compelled to live in enclaves and ghettos on three percent of the land for eleven years; this was the real moment of separation for them. These Turkish Cypriots, who found themselves Stateless in one night and were threatened by the State that was supposed to protect them, had to form their own administrations and govern themselves. The author claimed that since 1968, Turkish and Greek Cypriots have been negotiating on and off to resolve the so-called ‘Cyprus Problem’ without any success. Greek Cypriot regime, being an illegitimate and unconstitutional representation, has become the main reason for the fruitless nature of these dialogues. Despite these facts, the third parties continue to intervene for the betterment of the Greek Cypriots. He further argued that the gashes of past have changed the future of this little island drastically and are remain fresh in the minds and hearts of many. The two peoples have now been living separately under their own administrations since 1963, and each side is holding tightly to its own state. The last four generations in Cyprus have been living with the unresolved ‘Cyprus problem’ overshadowing their lives. This issue can still be resolved however, if the existing realities in Cyprus and their roots are properly diagnosed. The separation of the Turkish and Greek Cypriots is irreversible now. It took over a 100 years to excite the Greek and Turkish Cypriots in Cyprus to separate. As for now, these people need to find ways to coexist once again in a peaceful manner, but as separate, distinct identities, such that their good relations may become as a model for respectful coexistence for the whole region. In my point of view, the writer is much concerned about the state of the crisis on the island. While it is true that the separation is irreversible, it cannot be ignored that this separation brings instability in the political as well in their social structures. The writer is keen to promote peace and stability of life for both sides, and claims the people are similarly inclined. He is convinced that they are waiting for any positive step from all these discussions bring held. Both sides have to utilize any and all opportunities that will enable the flow of good relations at every level, which will eventually result in the betterment of their own lives as well as the region as a whole.